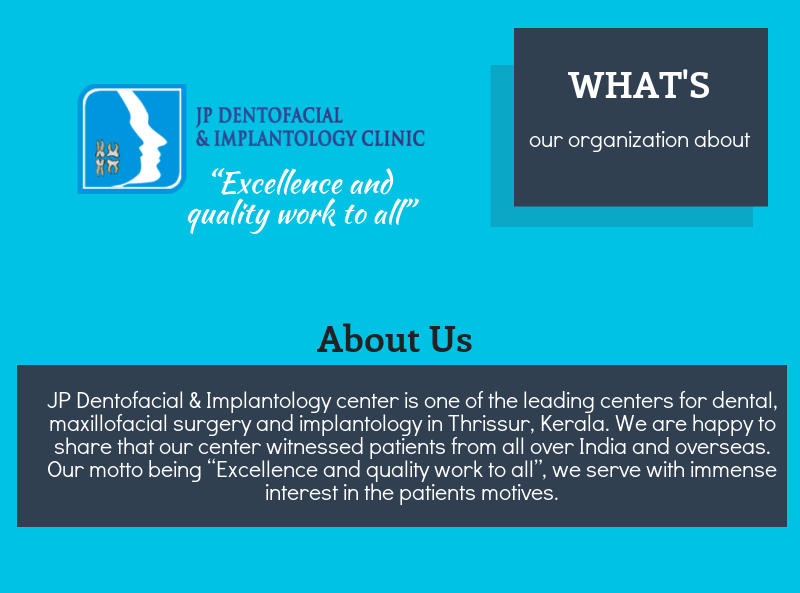 Located in the main road from Thrissur to Palakkad , about 4km from Swaraj round , very convenient for transportation as bus stand and auto stop are just 50 meters from clinic. A pleasant white colored building with name of our team as an indicator. Our center is in the 1st floor of the building, a separate way with directions to make it easy for people to get into reception and waiting desk. Warm receptions with supporting staff to guide through are always available. The waiting desk is open aired with greenery surrounding it for a pleasant experience. A well equipped center with 4 modern dental chairs within wide area to have a comfortable range of working space and privacy for each patient. Pleasant surroundings of our center adds on to the psychological benefit. Latest x ray equipment within the clinic makes it easy to assess the outcome within a short period of time. Intra oral camera with LCD monitor makes the sessions interactive to educate the patient regarding the condition and treatment to be done for the same. Sterilization: Our prime importance is to provide a safe and harmless treatment. We are equipped with latest sterilizers and ample instruments.